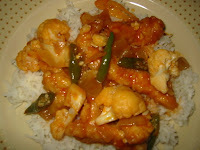 It's stir fry chicken, cauliflower, and pineapple in tomato sauce. Special thanks to Mbak Ida from Indonesia who made this delicious recipe. You can see her original recipe here. Put sliced chicken into the egg batter and dredge it into the flower mixture. Fry the chicken in the oil until golden brown. Put aside. Heat the oil in medium, heavy skillet, over medium heat. Add the onions and the garlic and saute it until fragrant. Add the hot peppers, the oyster sauce, and the soy sauce. Saute it for a little bit. Add the water or chicken broth and let it boil. Add the tomato sauce, the ground pepper, and the sugar. Add the cauliflower and cook it but not overdone. Add the chicken and the pineapples. Add the corn starch. Stir it until it well mix. Ayam Wailuyuk is ready to be served with warm white rice ... hmm delish!! !